Xanthor was a character which received very little screen time. He appears to have a slight resemblance to Carl Sagan, and/or Mark Lenard. This is a wee bit uncanny, because his ears appear to be very slightly pointed. He also resembles Futurama's rendering of Leonard Nimoy. 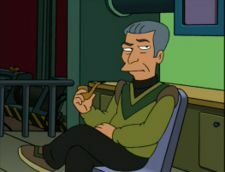 He smokes a pipe (or at least pretends to), wears a black turtleneck with a green futuristic V-neck sweater, and has been seen to raise his left eyebrow as a sign of acknowledgment. It has been speculated by fans that he is in fact Planet Express's chief philosopher, however, nothing at all is known about the character in actuality. In Bender's Game, when Bender thinks he is "Titanius Anglesmith - Fancy Man of Cornwood", he mentioned during his group therapy session that there are a band of river trolls hiding in the moat and they won't let them out until they hand over the "Golden Scepter of Xanthor". It is possible that his name is properly spelled with a 'Z', however, then his name would have absolutely no meaning. If we assume that his name is in fact spelled with an 'X', however, then his name can have several meanings. One of them involves the prefix "Xantho-", which is borrowed from Greek and means "Yellow", thus the existence of the word "Xanthous", which is an adjective meaning "Yellow". Possibly this could be a Simpsons reference. The name may also be a reference to the Norse god Thor. The spelling "Xanthor" is used in the subtitles of the Region 1 DVD; however, the spelling of character names in the subtitles has changed throughout the years. However, it is much more likely that Xanthor's name is taken from the word Xanthochroi (literally 'yellow-skinned'), a name invented by T.H. Huxley for the light-complexioned or light-haired peoples. In the end, no one knows anything about who he is or why he is or what he does. Perhaps this is on purpose as such characters are known to appear in Matt Groening's cartoons. Incidentally, it is interesting to note that Xanthor's name is misspelled as "Xanfor" in almost every transcript and message board on the internet. And no one ever used or even hardly mentioned the name "Xanthor" or "Xanfor" anywhere on the internet until a member joined PEEL under the latter. This page was last edited on 8 July 2015, at 21:02.